The ideal vacuum cleaner is one that can replace your main upright vacuum, but has more options and uses. At the very least, you want to be able to reduce the amount of times that you have to get out your heavy upright vacuum. The Dyson DC35 Digital Slim Multi Floor Cordless Vacuum Cleaner has the potential to be that vacuum. 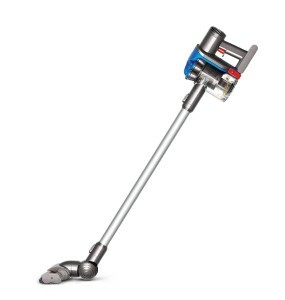 With the patented Dyson technology, this vacuum is the most powerful cordless vacuum cleaner on the market. While the ideal use for this vacuum is for cleaning up quick messes on many different surfaces, it may even be strong enough to use throughout your entire house. It comes with different attachments and accessories that make your cleaning a lot easier. Maneuverability is one of the best things that people like about the Dyson DC35 Digital Slim Multi Floor Cordless Vacuum Cleaner. Its slim and lightweight design will allow you to clean up high, underneath things and even in between things. It is the ultimate portable vacuum that can be used as your normal household vacuum, and also be transformed into a vacuum for even your vehicles. The motorized floor tool will clean just about any carpet, while the anti-static carbon fiber brushes will remove even the finest dust particles from hardwood floors. The convenient wall mount charger can be placed anywhere that you desire. It only takes about 3 hours to get a full charge, and you can have about 20 solid minutes of use, which is more than enough. It also includes a trigger to use, so that you only use up the battery when you need it. With its slim design, the Dyson DC35 Digital Slim Multi Floor Cordless Vacuum Cleaner has a pretty narrow head, meaning you will have to make more passes than with a larger vacuum. You will just have to balance convenience with the amount of time spent vacuuming. Since it is a cordless vacuum, the battery won’t last forever. You have to weigh the pros and cons for the price you pay on Amazon and decide whether you want to go with a cheaper model. A new battery may cost as much as a whole new vacuum, and this vacuum may last you 3-4 years before you have to buy a new one. This is the ultimate portable vacuum cleaner that can be used for just about anything. The lightweight design and versatility of the vacuum makes it easy for anyone to use. Dyson’s Root Cyclone Technology is a major selling point for the Dyson DC35 Digital Slim Multi Floor Cordless Vacuum Cleaner. You will never have to worry about losing suction, no matter what surface you are vacuuming and no matter how messy it is. Having as much power as you need to clean your house is important, and that’s exactly what you will get with this vacuum cleaner. In addition to vacuum cleaners, Dyson also manufactures and sells products like bladeless fans, hand dryers and heaters. They take pride in their innovation and coming up with ideas that will change the industry. Power and quality are the two main things that they incorporate in each of their products, and you can tell that with each one that you purchase. They manufacture both commercial and residential products to the same strict standards, so you can ensure that you are getting a quality product if it has the Dyson name on it.